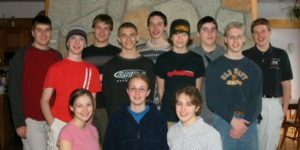 This was our first season as an FRC team; the game was called Triple Play (2005 FRC Game Animation). In this game, the field was dotted with nine triangular towers, arranged in three rows of three. Either ends of the playing field were considered safe zones for each alliance. The game pieces were 31 by 31 inch tetrahedrons called Tetras. The game began with an autonomous period where the robots collected special vision Tetras and attempted to place them on top of the towers solely operating by previously programmed code. During the tele-op period when drivers took the wheel, robots maneuvered about the field, stacking Tetras atop or beneath the towers. When they drove up to a loading station, a human player would leave a pressure sensitive pad, which would temporarily deactivate the robot, and hand it a Tetra. Only after the human player returned to the pressure sensitive pad would the robot be able to continue the game. Robots could also obtain game pieces by picking them up off of the tables sitting just outside of the field’s perimeter. In the endgame, an alliance achieved 10 bonus points if all of the robots drove behind their safe line at either end of the field. The alliance was awarded 3 points for every one of their Tetras placed on top of the tower and 1 point for every one slid underneath. Finally, 10 bonus points were added to each row of three formed by Tetras placed on top of the towers either vertically, horizontally, or diagonally. Given the stock of FLL® awards received by Mindstorms Mayhem and Mach 6, from which the core of our team came, we had high expectations. Like most rookie teams, we had no idea how much we didn’t know! We thank the many teams and individuals who gave us good advice and helpful hints throughout the season. What we did know how to do was work with FLL teams and the homeschooling community, and so we had quite a bit of community activity. We also submitted several FLL related talks for the conference to be held at the Championship Event in Atlanta. We were working the software to track and capture vision Tetras, but the mechanics ended up being far too much a last minute affair. The drive for the rack and the “couch” that held the Tetra were still incomplete at ship date. At the Granite State Regional we played defense for our matches, while attempting to complete the operating mechanisms between rounds. During one practice round, we tried to test some of our autonomous code. Due to a combination of a software bug and uneven drive power we ended up rapidly arcing around the center goal and brutally slamming the unsuspectingRoborebels (1153) robot innocently in its starting position in the far diagonal corner of the field. Our drive team became very proficient at the “strategic bump” and “felled a lot of tall timber” during the qualifying rounds. By Friday night, we finally could move the “couch,” but never scored points in the qualifying rounds. Not surprisingly we were in the lower tier of the standings. To our amazement, during the alliance selection, team 1153 had selected B.E.R.T (133) and apparently was looking for an “enforcer” to complete their alliance. Who better than the ruffians who smash people in autonomous mode? They selected us, and our alliance made it all the way to semi-finals! We were ecstatic! To top it all off our team was awarded the Rookie Inspiration Award, recognizing a rookie team’s outstanding efforts in going beyond what is expected of rookies. 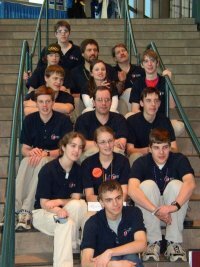 Although our robot didn’t make it to Atlanta, quite a few of our team members did. The Mindstorms Mayhem FLL team again represented New Hampshire at the FLL World Festival, involving many of the same families. In addition, two of our conference talks were selected, presented by two of the students on the team. We watched many matches and attended many conference sessions, learning a lot for our future. Over the summer the Mayhem continued. We are grateful for the off-season competitions, when we can eventually get the robot to behave as it was intended. On May 21, we attended Beantown Blitz, our first competition where our robot was fully functional! There, our robot placed a Tetra on the center goal for the very first time. Our drive team was very pleased. This competition showed us where we were weak so that we could prepare for further competitions. In June we competed in the newly relocated Mayhem in Merrimack tournament. With a name like that we had to do what we could to help, and started an annual tradition of helping Chop Shop (team 166) set up the field the night before. In competition the next day we had more time to practice with our fully functional robot, and we did better in competition, getting all the way to semi-finals with our alliance partner, the now inactive Team 549 (The Devil Dawgs from Leominster, MA). We finally felt ready for the pinnacle of the New England off-season, Battle Cry@WPI! At Battle Cry, June 17-18, we had a lot of fun. The first day we got there as early as we could to get in some final practice rounds before the qualifying rounds began. The next day, after we had gone through all the qualifying rounds we were seeded 15th. However, since some of the highest seeded teams picked some of the other high seeded teams, we got the opportunity to pick alliance members! We picked The Intimidators (61) and the now inactive FRC team Kaizen Blitz (1276) to be our alliance partners. Our alliance made it to quarter finals. Our team also did well in the extra challenges, winning the Special Operations (“Tetra-Tantrum”) Award with our driver’s intense driving skills, and the Air Superiority (StuBot/Human Player) Award with our three players’ speed and strategy. landing us in 5th place seeding – the Highest Rookie Seed! What a great way to end the Triple Play season. After River Rage we began a new program for our students called FIRST®STEPS–Student Training: an Early Program for Success. In this program one of our coaches made up a game challenge and split the team into three sub teams (the Cutters, the Riveters and the Grinders). Each sub team had to design and build its own mini robot to complete the challenge, with little to no help from the coaches. 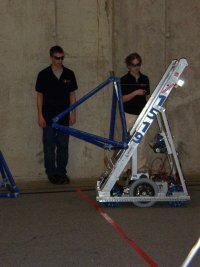 The coaches’ aim in doing this was to give the team members experience in taking total responsibility for a project like building a competitive robot. They all learned valuable lessons in time management, leadership, teamwork, design, fabrication, electrical wiring and the helpfulness of CADing a potential design. This was a powerful preparation period.